It is time again for a Family Day!!! 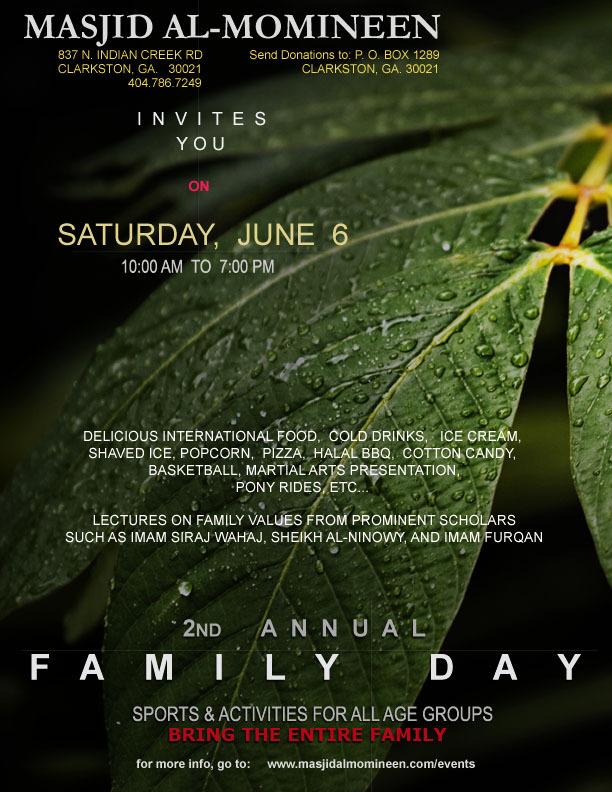 Our 2008 Family Day was such a success that we decided to make it an annual event. Hardly much can describe the joy in the faces of all those little children who came and stayed all day last year. Family constitutes the core of the Muslim society. We plan, inSha'Allah-ur-Rahman, to celebrate and honor this gift of family - one of the greatest gifts that Allah SWT has blessed us with - on Saturday, June 6, with lectures from prominent scholars including Imam Siraj Wahaj, Sheikh Al-Ninowy, and Imam Furqan; delicious international varieties of food, drinks, ice cream, cotton candy, shaved ice, sports and activities geared towards all ages for the entire day. Please forward this newsletter to your contacts in metro Atlanta, notify your friends and extended families, make announcements in your community center, and mark your calendar. We promise to do our best, inSha'Allah, to make June 6 a day to remember. Please bring your family and leave the entertaining to us. Stay tuned and visit the Events page of the Masjid's website regularly for future announcements as well as the event flyer.